June 21 - Nicol David, Malaysia's six-times world squash champion, and double junior world champion Mohamed El Shorbagy of Egypt were told they had "empowered" Namibian squash after completing a five-day Ambassador Programme there organised by the World Squash Federation (WSF). The compliment came from Tyc Kakehongo, national administrator of the Namibian Squash Association (NSA), which has been sponsored for the last 10 years by the Trustco Group, after the visit had concluded in the country's capital city of Windhoek. Namibia will host the All-Africa Championships, for both seniors and juniors, for the first time in 2013. "This will be a major operation for us – but this visit has given us new energy," said Kakehongo. "The whole experience has been very empowering for us – it will help give squash a higher profile in the country. "We hope this new energy will help us achieve our objectives, like new squash facilities in new parts of the country." The WSF Ambassador Programme, designed to highlight the appeal of squash in countries where the sport is in its infancy, arrived in Namibia after beginning its Africa leg in Malawi. Malaysia's 28-year-old women's world number-one David (pictured top), who led the inaugural WSF initiative last year to Latvia, was accompanied for the first time by 21-year-old El Shorbagy, the men's world number-eight from Egypt. "Seeing the joy on the faces of all the people we met in Malawi and Namibia made it all so worthwhile," said David. "It's so rewarding to be able to be able to give something back in the sport I love." 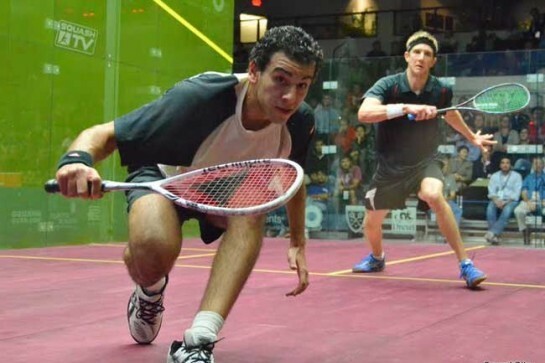 El Shorbagy (pictured above), an Ambassador for the first time, said he was delighted to have been part of the team. "It was a great experience for me to meet different people and different cultures and discover what they know about squash," he commented. "It was something new for me; I always wanted to do something like this, to promote the game, and I am really grateful to the WSF for choosing me to work with Nicol – and I hope it won't be the last time for me! "Working alongside Nicol has been really special. "I only knew her as a squash player – a great player – but now I've got to know her as a person and she's a great person as well." Quinton van Rooyen, chief executive of Trustco, commented: "It is truly an honour to host this distinguished group from the world of international squash. "Sport builds bridges, but squash builds even bigger bridges." In Windhoek, the visit came to a close with an evening at the city's Wanderers Squash Club, in which David took on the country's top five women, one after the other, and El Shorbagy showed off his prodigious talent against the nation's top five men. The evening attracted a capacity crowd which included both the Ambassadors of Malaysia and Egypt – Mustafa Mansor and Dr Haxem Ramadan, respectively, accompanied by several of their staffs – plus Ben Naobeb, vice-chairman of the Namibia Sports Commission. Gwen Lister, the distinguished founder and long-time editor of The Namibian newspaper, was recently invited to become Patron of the NSA after falling in love with sport when introduced to it at the age of 49. "Squash is a niche sport – but I think it can break barriers," she said. "We must make the sport accessible to youth in the townships. "In order to get more sponsors, we have to ensure that squash is more readily available to the black community."